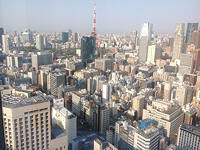 Japan has been on our wish list for many years, with some of our clients asking if we can offer tours to Japan. We decided to visit this year and chose late March/early April for the famous annual cherry blossom (sakura) period. Unfortunately the flowers opened a little earlier than expected this year and when we arrived in Tokyo on 31st March the trees were coming to the end of their blossoming. Japan is a very different country to our other South-East and East Asian countries. To start with there was no tour guide and driver awaiting us at the arrival airport. Instead we followed the instructions from the Japan Rail Pass that we purchased online before we left UK to go to the JR Pass collection office on a lower level of the airport arrival building. From the first day I found that all notices and information displays were written in both Japanese and English and offered clear direction information. We found the JR Pass office without any difficulty within 10 minutes. There was a small queue waiting. The Japanese are nothing if not orderly and well organised. A pleasant young staff member helped us to fill in the short form, then counter staff checked our papers and passports and directed us to one of five or six ticketing clerks who issued our JR Passes with immediately effect so that we could take the Nartia Express Airport Express train to the centre of Tokyo. At the same time we made seat reservations for our next major transfer to Kyoto in 6 days time. It was all very efficient, and the kind of good service with a smile and a bow that we came to appreciate throughout Japan. We were told the platform number and train departure time, so made our way to the train station. As expected, the train arrived exactly on schedule and left quickly as soon as all passengers had boarded. We found our reserved seats in the 'Green car' which is the equivalent of first-class. I would recommend this option especially in this busy season. 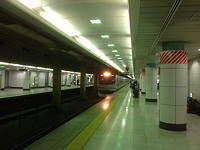 The 50 minute journey to Tokyo central station was quiet, smooth and comfortable, the train arriving exactly on time. We were staying in the Shimbashi/Shiodome district which is just two subway stops from Tokyo station, but we decided to take a taxi straight to the Park Hotel where we were to stay for five nights. This is a modern hotel, the top half of a skyscaper building in a very good central location. This hotel offers many rooms decorated by different artists in a range of styles from Japanese traditional painting to modern art. They are beautiful and colourful. 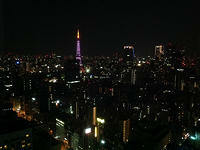 We chose and booked a room with no artist's work but with a view of the famous Tokyo Tower which changes colour every night. In the daytime we had a great view the city from the thirty-third floor. On Day 2 we started our tour of Tokyo in Harajuku.